America, sometime during the 60’s. Following the Beat-Generation, Hippies are dominating the street scenery now. So it’s Love, Peace and Happiness all around? Yeah right. Not everyone chooses to reject materialism. Gangs are no longer armed with switchblades and bats. The Gun Control Act of 1968 has not been passed into law yet and automatic weapons move freely into the country and across state lines. Skirmishes and gangland wars take a heavy toll. The gang conflicts aren’t just driven by territory... they are also driven by business opportunities. Gang bosses invest more and more into legal business affairs, but don’t hesitate to unleash their thugs on the competition to gain an advantage. You are not the good guy this time. The stakes are high and your competitors are enemies – in the boardroom and on the street. Forget about “honorable businessmen”, “offers, you can’t refuse” and “families” – it’s only Greed that counts! The game is played over 12 game rounds. Each round a player selects a card from their pile and adds it to their hand, plays a card and passes the pile on to their neighbor. This way players hire thugs, who lend their unique talents, take shares in business establishments and perform actions of varying legality. 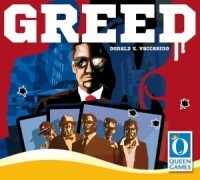 Add a Review for "Greed"